Gavin Worth has created a name for himself sculpting simplistic structures bearing undeniable emotion: Ralph Lauren and Tiffany & Co. merely being two companies who have used his designs in window displays. 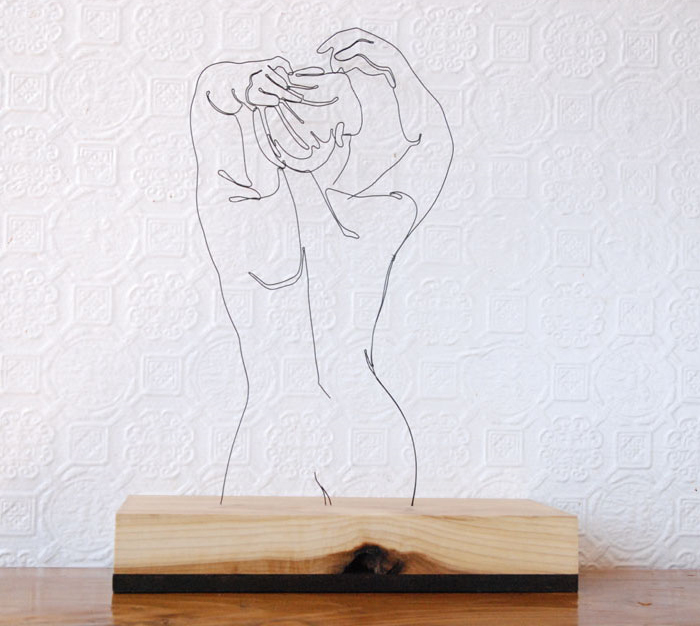 With each different angle, these sculptures change into new creations. Most notably, Worth’s piece “The Egyptian Sibyl” frames the ever-changing sky in Cairo, Egypt. Currently residing in Lausanne, Switzerland, Worth continues to sculpt, now focusing on the way lighting can be integrated into his art. 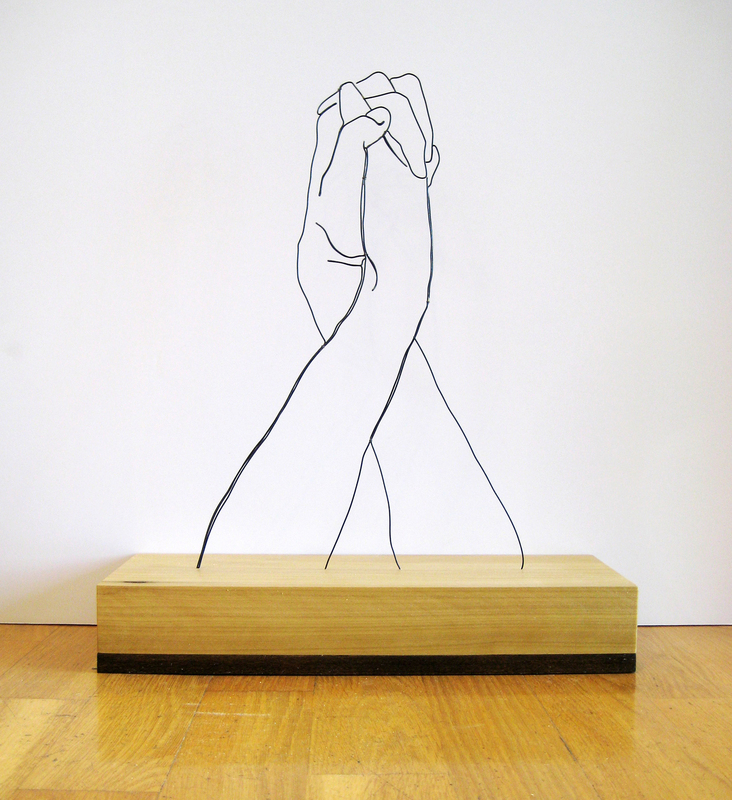 What and when did you get the idea to do wire sculptures? I grew up in the middle of the desert outside of Las Cruces, New Mexico. It was really rural… finding scorpions in the sink rural. You could hear coyotes howling at night. My brother and I used to explore the desert with every free second and, because there was really nobody around, we’d make up our own games. Probably the best one was where we dug holes. Sometimes we’d put rocks or flowers in them, but mostly we just dug holes. Don’t judge… when you’re 5 years old living in the middle of a desert, this is as fun as it gets. One day, we decided to go find some really outstanding holes that we had dug a few months before down in an arroyo. I found it and reached in to get the rocks or whatever I had put in there. I was feeling around when I felt a really strange sensation… a cold feeling moving around my wrist once, then twice, and then a sharp pinch on my finger. I pulled my hand out and saw a rattlesnake wrapped around my arm, fangs fastened on my index finger. I flailed my arm and finally flung it off and, panicked, ran for home. We told my parents what happened and they were in an uproar. I was rushed to the hospital, but our town was so remote that they had to helicopter the antivenom in from Albuquerque. I made it, but even today my finger only has one joint to it. Where are you settled right now and what are you working on in this environment? Right now, I’m living in Lausanne, Switzerland. It’s one of the most beautiful places I’ve ever been, and I’m working on a couple of different projects here. I’ve been doing quite a bit of experimentation using light to create a kind of functional art piece. I’ve been working on developing a series of illuminated wall panels that double as practical light fixtures. The inspiration really came when I found myself traveling quite a bit between France and Cairo. I’ve always loved the Art Nouveau sensibilities that are found in very corner and alleyway in Paris and I would leave there with my sketchbook full of what I had seen in the architecture there: whiplash curves and spindly vines and stylized flowers and the idealization of the feminine form. Coming back to Cairo, I would marvel at the starkly minimal but no less elaborate Moroccan lamps in the bazaars and markets. I was suddenly struck with the idea to make a more minimal Art Nouveau piece – one that focuses on naturalism, line, grace, and simplicity. It’s been a fascinating project to work on and there’s a lot more information about it at: www.gavinworthlighting.com. Additionally, for the past few years, I’ve gotten the opportunity to make several large-scale sculptures in different places around the world. I’ve absolutely loved it. I recently completed a massive 20 foot wire sculpture in Cairo, “The Egyptian Sibyl,” that uses the raw, vibrant Egyptian sky as a backdrop, and it was thrilling to make. I feel myself leaning towards that larger scale in my personal work. I’m still in the early conceptual phase, but I am planning on making a series of life-size figurative wire pieces, loosely inspired by Paul Klee’s heart-wrenching angels. When and why did you switch over from acting to producing physical art? Visual art had certainly been the earlier, and probably deeper, interest for me, but in college, I fell into acting. I was extremely shy growing up so it was helpful for me in that way to break out of my shell and find confidence, to give my voice resonance, and to think on my feet. But I really did fall in love with the art of it. After college, I auditioned and got a job with the Santa Fe Shakespeare Festival and it was awesome. I acted in a repertory of roles, designed educational programs, wrote music, built sets, and toured the Southwest. Later, I did similar work with the San Francisco Shakespeare Festival and the California Shakespeare Theater. It was great, but I remember looking at my script of “The Merchant of Venice” one day, looking in the margins, and seeing more sketches of my castmates than notes about my role, so I figured maybe it’s time to go back to the visual art. Which travel experience has most affected your art? When I was 16, I traveled to South Africa and Zimbabwe for three months. That really shook up everything. It wasn’t as random as it sounds… I actually was born in Zimbabwe, I have lots of family in the area, and I had always wanted to see where I was born. I took extra classes or whatever, graduated high school one semester early, and flew from El Paso, Texas to Johannesburg, South Africa. I was instantly mugged. Like instantly. I think I had been on the ground 30 minutes, I’m walking through the bus station, and a guy grabs my arm hard, pulls me close, and whispers in my ear, “Your life is in danger.” I figure out what’s happening and give him all that I had in my wallet: 20 English pounds. He doesn’t understand what the different currency is, so he grabs my backpack. I struggle with the guy and all of a sudden, five other guys surround me. Everything was in slow motion at this point, just like in the movies, and I figured this is it. I’m done. I’m dead because I can’t explain how to exchange currency under pressure. A couple of the other guys grab my arm. Then they grab his arm. They were undercover cops. It was ridiculous. I got out of there and I was in a daze for a week — I slept with a steak knife under my pillow. I was terrified to go anywhere. Finally, it dawned on me that since I didn’t die that day, every day after that was a bonus… a beautiful, wonderful, shining, living, breathing gift. You get to wake up and see the sun and isn’t that wonderful because you’re sitting in the sun right now. Or you wake up and it’s raining and how amazing is that because you get to be in the rain on the planet Earth. It was a tiny mental shift that got me through a lot of times. When I was really poor, I framed it as a fantastic, romantic adventure. This was the thing that most affected my art because that’s when I decided I would passionately pursue it, wherever it led me, till the end of my days. If you only get one try at it, I’m going to paint and sculpt and write and learn piano and travel to the far corners of the earth to seek out the love of my life. After that realization, to me, working in an office just so I can fill a house with stuff seemed sort of lackluster. 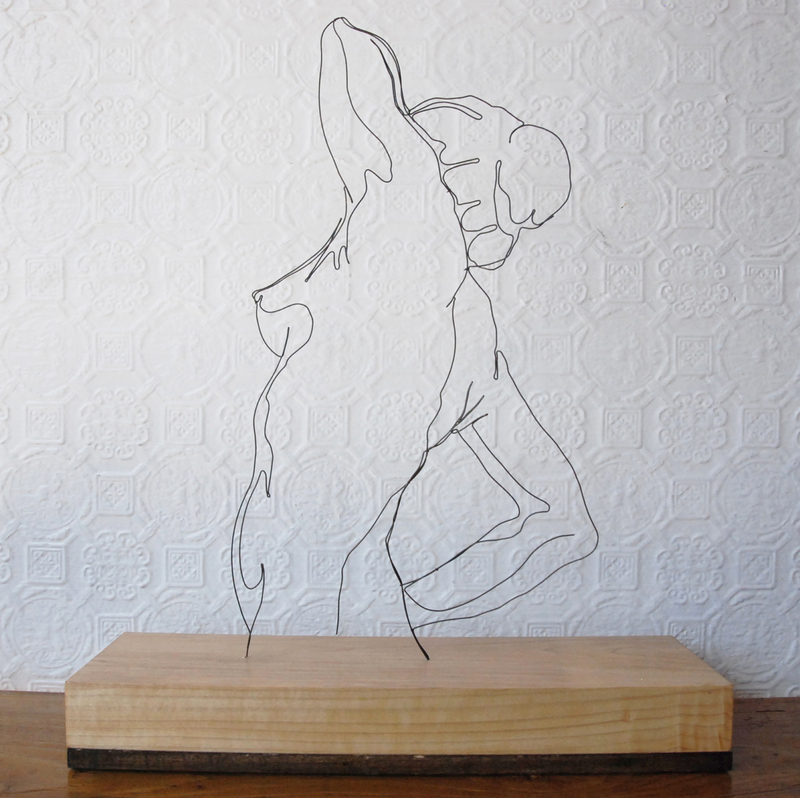 Explain your mindset, thinking process, and environment when working on one of your wire sculptures or in your studio. I’ve always felt that Michelangelo is just about the paragon of visual expression, so I take his advice very seriously: “Draw, Antonio; draw, Antonio; draw and don’t waste time.” Drawing is the basis of everything, be it sculpture or painting. So that’s the vast majority of the process in the studio: drawing. This part of the process, the creation of the design, is the scariest. This is when you look with disbelief at the piles of crumpled paper around you. But it’s thrilling when you get it… when you can capture a gesture honestly or get a movement or an expression or you’re hit with a really evocative image. Then, you get to put the material in your hands and try to coax it into honoring the concept of the design. That’s when the music is blaring and time just stops. Besides art, what do you find yourself doing often? I love cooking. Playing guitar. Reading. My favorite thing is probably taking a walk with my wife and trying to make her laugh. That’s much easier to do now that we’re in Switzerland… going on a stroll in Cairo is taking your life in your hands. Explain your process of self-education in art. There is no glamour here. It’s simply lots of work, lots of practice. You copy the work you admire and you get a feeling for how it was done. How was this area rendered? Why is the line used this way? You gain an intimate knowledge about what different media can do. Go outside and draw from life, draw the things that fascinate you. Read. Take seriously the art of image-making. Your basic skills become sharper, more natural, and at some point, you don’t have to think about them at all. Mostly, it’s about putting your ego aside, and do work to honor your art. I’m not interested in art that honors ego. I’m interested in art that honors something, anything, outside of the self. Do you have a dream spot to display your art? New Mexico: Not only did I grow up there, but New Mexico has the most beautiful sky I’ve ever seen anywhere. 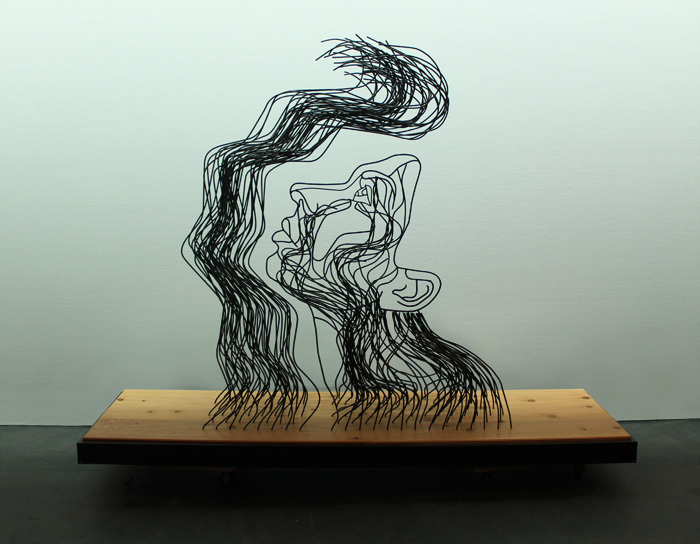 If a wire sculpture is a free-standing line drawing, that sky would be an unbelievable canvas. Zimbabwe: I was born there, yes, but I love it. There’s magic there. Paris: Because it’s Paris. Come on. Coffee, of course. But none of those latte espresso drinks. Just regular brewed coffee with milk and sugar. It’s the best thing ever, and for some reason I’ll never understand, it’s impossible to find outside of North America.